Baby Russian tortoise care is very important. Care should be taken to make sure that tortoises do not overeat, but they do require to be given fresh food every day. It’s also important to make sure that Horsefield tortoises always have access to fresh drinking water, particularly the females when they are breeding. 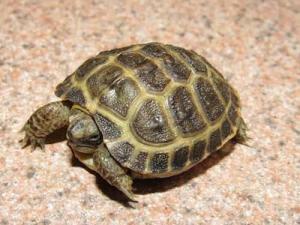 Russian tortoises are also known as horsefield tortoises require a balanced vegetarian diet. The diet can include a wide variety of plants, as long as they are not poisonous and have not grown in an area sprayed with agricultural chemicals. Leafy greens and weeds should be a big part of the diet, including dandelion, mallow and common grasses. In order to maintain a healthy shell, a tortoise needs plenty of calcium in its diet. Calcium supplements can be purchased from any good pet store. Limestone flour, which is very high in calcium, is available from most equestrian suppliers. Calcium, mineral and vitamin supplements should be scattered over the leaves that form the main part of the diet. A Horsefield will be happy being housed with other Horsefields. This species cannot tolerate high humidity and must never be kept in damp conditions. Suitable housing, indoors or outdoors, needs to be prepared in advance of a tortoise being purchased. Make sure that an outdoor enclosure is well drained and can be kept dry. The Horsefield is very adept at digging and tunnelling, so a layer of wire mesh should be placed at least eight inches below the surface. Different ground levels formed of mounds and rocks will make a tortoise feel safer and less exposed. Climbing rock surfaces also helps to keep claws short. Both outdoor and indoor housing must be kept clean and dry. A ground layer of sand, soil and gravel can be topped with hay and woodchips to provide a suitably dry surface. A dish of clean water should always be provided. A few clean stones placed in and around the dish will allow easier access for younger, smaller tortoises. A feeding platform can be made from a piece of slate or a flat rock. This will prevent food from getting mixed in with dirt and other non-edible substances. 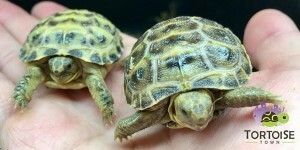 As a captive bred tortoise breeder and tortoise farm, we have the highest quality baby star tortoise, leopard tortoise on sale, burmese star tortoise for sale, box turtle for sale, baby sulcata tortoise for sale, african spurred tortoise, african spurr thighed tortoise, spur thighed tortoise for sale, russian tortoise for sale, greek tortoise, we also offer baby hermann’s tortoise to buy online. When considering a baby tortoise for sale or baby tortoises for sale online, consider buying from a real tortoise breeder that provides lifetime customer support, free of charge.Tortoise Town is proud to offer a variety of captive bred box turtles for sale, turtles for sale, tortoise hatchlings for sale, including sulcata tortoise for sale, baby sulcata tortoise, russian tortoise for sale, burmese star tortoise, Sri Lankan Star Tortoise, indian star tortoise, box turtle for sale, we offer the ability to buy pet tortoise online and get it shipped overnight to your door. Leopard tortoises (tradtional common Leopard Tortoise) Pardalis Pardalis also known as the Giant South African Leopard Tortoise for sale. We offer Leopard Tortoise hatchlings for sale, baby tortoise for sale, well started leopard tortoise for sale as well as adult leopard tortoises from time to time when available.